Since I have started my endeavors with The Quantify Group, I have been on countless prospective client meetings. Most of the prospects are small business owners who keep their accounting records on the desktop version of QuickBooks or a comparable program. After I learn this fact from them, my first question to the owner is have you considered switching to QuickBooks Online? Many times, the response is negative. In general, the reasons are based on the fear of making a switch or the fear of change. 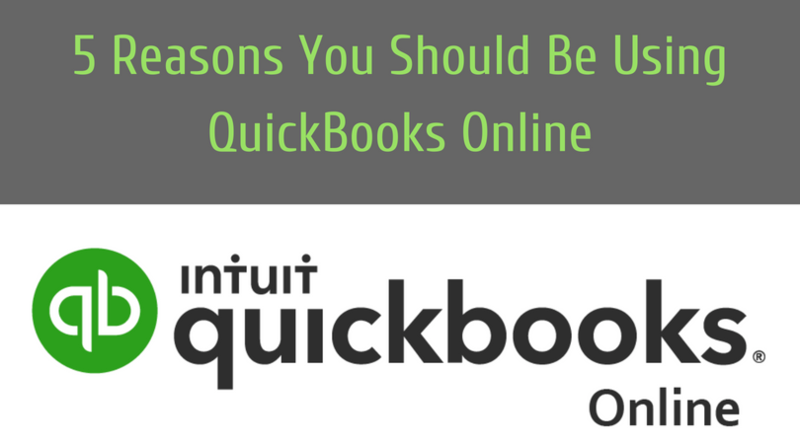 This week I wanted to shed some light on the benefits of QuickBooks Online (“QBO”) through a list of the important benefits of QBO. The items on the list are from my own personal experiences with the program and how making the switch has helped my clients. Before I started, I wanted to let everyone know that we do not receive any benefits from Intuit besides those that we can pass on to our clients via the ProAdvisor program. To me, this is one of the most important features. QBO allows the users of a company file to access the program from any location or from a multitude of devices. All you have to do is go to the QBO page and login. This feature allows multiple users and companies locations to have access to the program without the need for any additional software. In addition to this, QBO allows for multiple users to access the program at the same time. This is extremely helpful if you have a bookkeeper and an Outsourced Accounting firm like The Quantify Group. In the past, I have worked with multiple clients to train bookkeepers when we were both in the QBO program. This saved a great deal of time and expense as we were able to do quick or even longer trainers remotely. QBO has multiple solutions that allow for automatic transaction processing. First, there is a powerful automatic bank and credit card transaction feed. This feed allows for specific transaction customization that will automatically recur each time, including splitting expenses between accounts and business segments. Secondly, QBO as several features for customer billing, payroll, and email reports that are automatic as well. Lastly, Intuit provides automatic software updates and automatically backs up the company file. A major benefit to analyzing a company’s profitability through QBO is the addition of the “locations” feature. In addition to a “class” system, the location system provides even more granularity to determine overall profitability. To those who are unfamiliar with these features, here is an example. Say your company has 3 business segments and 10 total clients. By combining the class and location feature you can track profitability by business segment (class) and by each specific client (location). On top this, QBO provides two tracking benefits. First, the owners and employees of the company are able to track deductible business mileage through your phone’s GPS system. Secondly, QBO provides unlimited billable time tracking. For those companies who do not want to invest in high priced paperless document storage, QBO allows companies to upload documents and link them to specific transactions. This will keep your accountant happy as well. He or she will always have access to supporting documents to help minimize your taxes. Some other things that QBO offers are unlimited phone support, 3rd party applications that supplement QBO, batch invoicing, and customizable management reports. I know that I have only highlighted the positives of QBO that I have experienced personally. As with everything else in life, there are always some downsides. However, I truly believe these are outweighed heavily by the positives. If you would like to discuss any of these items and even the cons of QBO, shoot me a message at asteinberg@thequantifygroup.com!